It has been said that an Army travels on its stomach—and depends on its ammo. This is another way of saying that, although the Quartermaster Corps is probably the most mundane and unheralded segment of any military, it should share top billing with the most elite of the frontline combat troops. If the Quartermaster Corps doesn’t do its job, every combat unit on every front would grind to a halt almost immediately. And the Quartermaster Corps can’t do its job unless it has access to the frontline troops and every support unit behind them. In combat, however, frontline access can sometimes be a problem. Contrary to popular belief, a Jeep can’t go everywhere in every kind of condition. Enter the four-legged Jeep: the mule. There are few combat conditions that will stop a mule. It can even be trained to crawl to get down out of fire. It doesn’t need roads, and in most cases, if a man is capable of making it through a jungle or over the mountains, the mule can too. That assumes, however, that the mule can make it to the battlefield, which is often strewn with obstacles. Enter the mechanical mule: the airplane. What we have in this photo are two combat tools that together helped our armed forces in several wars and always under tough con­ditions: the C-47 and the mule. The “Gooney Bird” gets the mule into the combat zone, and the mule takes the supplies to the front lines. 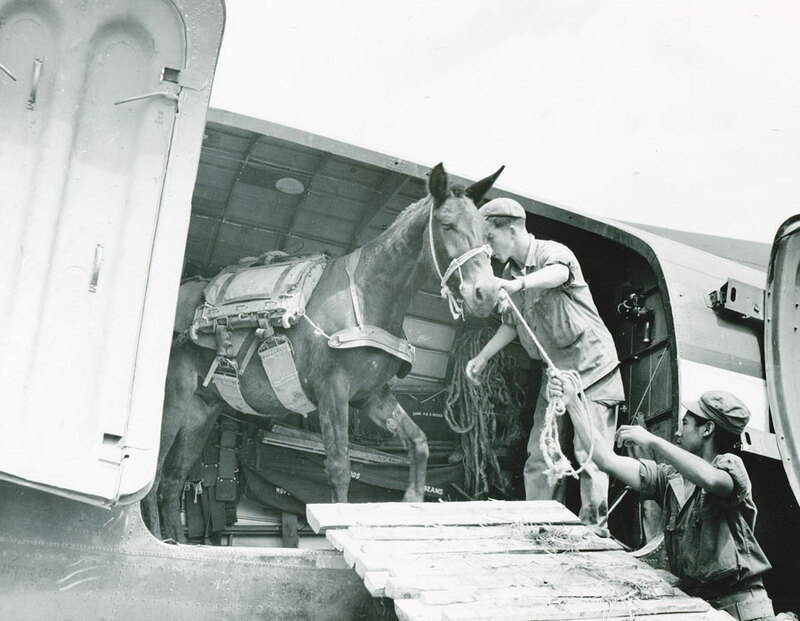 During World War II, the U.S. Army maintained three major “remount” centers, which trained tens of thousands of mules, horses, and dogs for the combat units. The problem was getting them there—“there” being Italy to help in the mountain warfare and the China-Burma-India Theater in combating the Japanese in Burma. To get across the oceans, special freighters were modified to carry as many as 500 mules in special stalls. Once in India, they were transported by train to dispersal areas. There, they were most often loaded into C-47s or C-46s for a trip over the mountains and into landing zones hacked out of the jungle by the likes of Merrill’s Marauders, one of the British/Indian Chindit special forces units. They received their initial mules by gliders; then, when the airstrip was landable, the rest came in by Gooney Bird. The defenders of the Philippines depended on their 75mm pack howitzers, which were designed to be carried in six mule loads. They lost their battle, but the 97th Field Artillery Battalion (Pack) in New Caledonia took their howitzer-carrying mules into combat only three months after Pearl Harbor. There is a tendency to think that having pack animals in combat is an ancient concept, long since abandoned, but both mules and horses have been instrumental in providing transportation and moving loads in the rugged terrain of 21st-century Afghanistan. To this day, the U.S. Marine Corps Mountain Warfare Training Center, located in the wilds of the Toiyabe National Forest, northwest of Bridgeport, California, has a special pack-animal course built around mules and horses. The Gooney Bird has been retired but not the mules. The military recognizes that there will always be some combat situations where technology is trumped by animal husbandry, making the mule a tool of necessity. Besides, as was proven in desperate situations during WW II, when things get really bad, you can’t eat a Jeep.